The emerging topic of Parliamentary Informatics (PI) has opened up new terrain in the research of the scope, usefulness and contribution of Informatics to parliamentary openness and legislative transparency. This is pretty interesting when visualizations are used as the preferred method in order to present and interpret parliamentary activity that seems complicated or incomprehensible to the public. In fact, this is one of the core issues discussed, not only on PI scientific conferences but also on parliamentary fora and meetings. The issue of Parliamentary Information Visualization (PIV) is an interesting topic; not only because visualizations are, in most cases, inviting and impressive to the human eye and brain. The main reason is that visual representations reveal different aspects of an issue in a systematic way, ranging from simple parliamentary information (such as voting records) to profound socio-political issues that lie behind shapes and colors. 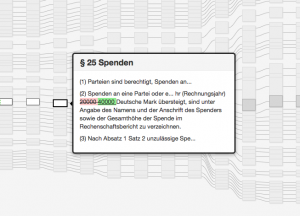 This article aims to explore some of the aspects related to the visualization of parliamentary information and activity. Recent research on 19 PIV initiatives, presented in CeDEM 2014, has proven that visualizing parliamentary information is a complicated task. Its success depends on several factors: the availability of data and information, the choice of the visualization method, the intention behind the visualizations, and their effectiveness when these technologies are tied to a citizen engagement project. To begin with, what has impressed us most during our research is the kind of information that was visualized. Characteristics, personal data and performance of Members of Parliament (MPs)/Members of European Parliament (MEPs), as well as political groups and member-states, are the elements most commonly visualized. On the other hand, particular legislative proposals, actions of MPs/MEPs through parliamentary control procedures and texts of legislation are less often visualized, which is, to some extent, understandable due to the complexity of visually depicting long legislative documents and the changes that accompany them. However, visually representing a legislative text and its amendments might possibly reveal important aspects of a bill, such as time of submission, specific modifications that have been performed, and additions or deleted articles and paragraphs in the text. Another interesting aspect is the visualization method used. There is a variety of methods deployed even for the visualization of the same category of Parliamentary Informatics. Robert Kosara notes characteristically: “The seemingly simple choice between a bar and a line chart has implications on how we perceive the data”. In the same line of thought, in a recent design camp of the Law Factory project, two designer groups independently combined data for law-making processes with an array of visualization methods, in order to bring forward different points of view of the same phenomenon. Indeed, one-method-fits-all approaches cannot be applied when it comes to parliamentary information visualization. 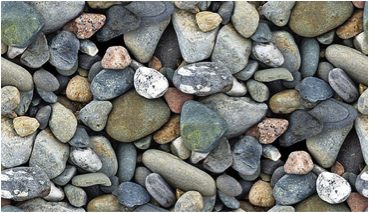 A phenomenon can be visualized both quantitatively and qualitatively, and each method can bring different results. Therefore, visualizations can facilitate plain information or further explorations, depending on the aspirations of the designer. Enabling user information and exploration are, to some extent, the primary challenges set by PIV designers. However, not all visualization methods permit the same degree of exploration. Or sometimes, the ability of in-depth exploration is facilitated by providing further background information in order to help end users navigate, comprehend and interpret the visualization. When it comes to knowledge gained through this exploration, it is understandable that knowledge is useless if it is not shared. This is a crucial challenge faced by visualization designers, because the creation of platforms that host visualizations and enable further exchange of views and dialogue between users can facilitate citizen engagement. Additionally, information sharing or information provision through an array of contemporary and traditional means (open data, social media, printing, e-mail etc.) can render PIV initiatives more complete and inclusive. An issue of information representation, or information trustworthiness? Beyond the technological and functional aspects of parliamentary information visualization, it is interesting to have a look into information management and the relationship between parliaments and Parliamentary Monitoring Organizations (PMOs). As also presented by a relevant survey, PMOs serve as a hub for presenting or monitoring the work of elected representatives, and seem to cover a wide range of activities concerning parliamentary development. This, however, might not always be easily acceptable by parliaments or MPs, since it may give to elected representatives a feeling of being surveilled by these organizations. To further explain this, questions such as who owns vs. who holds parliamentary information, where and when is this information published, and to what ends, raise deeper issues of information originality, liability of information sources and trustworthiness of both the information and its owners. For parliaments and politicians, in particular, parliamentary information monitoring and visualization initiatives may be seen as a way to surveil their work and performance, whereas for PMOs themselves these initiatives can be seen as tools for pushing towards transparency of parliamentary work and accountability of elected representatives. This discussion is quite multi-faceted, and goes beyond the scope of this post. What should be kept in mind, however, is that establishing collaboration between politicians/parliaments and civil society surely requires time, effort, trust and common understanding from all the parties involved. Under these conditions, PIV and PMO initiatives can serve as hubs that bring parliaments and citizens closer, with a view to forming a more trusted relationship. Most PIV initiatives provide information in a way compliant with the principles of the Declaration on Parliamentary Openness. 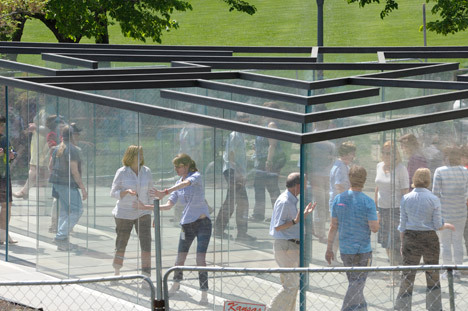 Openness is a necessary condition for transparency. But, then, what is transparency? Is it possible to come up with a definition that accommodates the whole essence of this concept? In this quest, it is important to consider that neither openness nor transparency can exist without access to information (ATI). Consequently, availability and accessibility of parliamentary information are fundamental prerequisites in order to apply any technology that will hopefully contribute to inform, empower and help citizens participate in public decision-making. 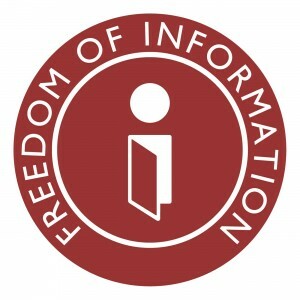 Apart from that, it is important to look back in the definition, essence and legal nature of Freedom of Information (FOI) and Right to Information (RTI) provisions, as these are stated in the constitution of each country. A closer consideration of the similarities and differences between the terms “Freedom” and “Right”, whose meanings we usually take for granted, can provide important insight for the dependencies between them. Clarifying the meaning and function of these terms in a socio-political system can be a helpful start towards unraveling the notion of transparency. Still, one thing is for sure: being informed and educated on our rights as citizens, as well as on how to exercise them, is a necessity nowadays. Educated citizens are able not only to comprehend the information available, but also search further, participate and have their say in decision-making. The example of the Right to Know initiative in Australia, based on the Alaveteli open-source platform, is an example of such an effort. The PIV initiatives researched thus far have shown that citizen engagement is a hard-to-reach task, which requires constant commitment and strive through a variety of tools and actions. 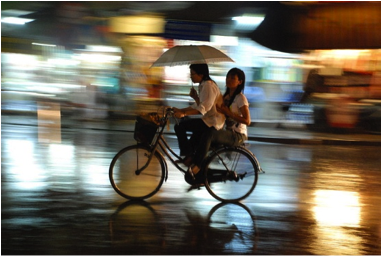 In the long run, the full potential and effectiveness of these constantly evolving initiatives remains to be seen. In this context, legislative transparency remains in itself an open issue with many interesting aspects yet to be explored. The links provided in the post are indicative examples and do not intend to promote initiatives or written materials for commercial or advertising purposes. 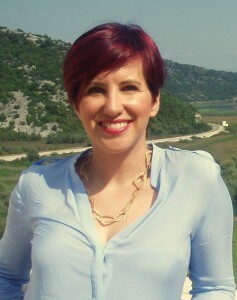 Aspasia Papaloi is a civil servant in the IT and New Technologies Directorate of the Hellenic Parliament, a PhD Candidate at the Faculty of Communication and Media Studies of the University of Athens and a research fellow of the Laboratory of New Technologies in Communication, Education and the Mass Media, contributing as a Teaching Assistant. She holds an MA with specialization in ICT Management from the University of the Aegean in Rhodes and a Bachelor of Arts in German Language and Literature (Germanistik) from the Aristotle University of Thessaloniki. Her research area involves e-Parliaments with a special focus on visualization for the achievement of transparency. 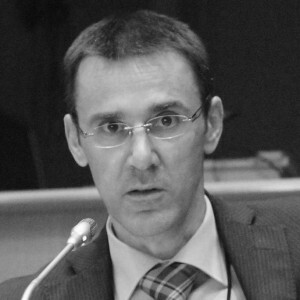 Dimitris Gouscos is Assistant Professor with the Faculty of Communication and Media Studies of the University of Athens and a research fellow of the Laboratory of New Technologies in Communication, Education and the Mass Media, where he contributes to co-ordination of two research groups on Digital Media for Learning and Digital Media for Participation. His research interests evolve around applications of digital communication in open governance, participatory media, interactive storytelling and playful learning. More information available on http://www.media.uoa.gr/~gouscos. There have been a series of efforts to create a national legislative data standard – one master XML format to which all states will adhere for bills, laws, and regulations.Those efforts have gone poorly. A significant obstacle to prior efforts has been the perceived need to create a single standard, one that will accommodate the various textual legal structures that are employed throughout government. This is a significant practical hurdle on its own, but failure is all but guaranteed by also engaging major stakeholders and governments to establish a standard that will enjoy wide support and adoption. What if we could stop letting the perfect be the enemy of the good? What if we ignore the needs of the outliers, and establish a “good enough” system, one that will at first simply work for most governments? And what if we completely skip the step of establishing a standard XML format? Wouldn’t that get us something, a thing superior to the nothing that we currently have? This is the philosophy behind The State Decoded. Funded by the John S. and James L. Knight Foundation, The State Decoded is a free, open source program to put legal codes online, and it does so by simply skipping over the problems that have hampered prior efforts. The project does not aspire to create any state law websites on its own but, instead, to provide the software to enable others to do so. Still in its development (it’s at version 0.4), The State Decoded leaves it to each implementer to gather up the contents of the legal code in question and interface it with the program’s internal API. This could be done via screen-scraping off of an existing state code website, modifying the parser to deal with a bulk XML file, converting input data into the program’s simple XML import format, or by a few other methods. While a non-trivial task, it’s something that can be knocked out in an afternoon, thus avoiding the need to create a universal data format and to persuade Wexis to provide their data in that format. The magic happens after the initial data import. The State Decoded takes that raw legal text and uses it to populate a complete, fully functional website for end-users to search and browse those laws. By packaging the Solr search engine and employing some basic textual analysis, every law is cross-referenced with other laws that cite it and laws that are textually similar. If there exists a repository of legal decisions for the jurisdiction in question, that can be incorporated, too, displaying a list of the court cases that cite each section. Definitions are detected, loaded into a dictionary, and make the laws self-documenting. End users can post comments to each law. Bulk downloads are created, letting people get a copy of the entire legal code, its structural elements, or the automatically assembled dictionary. And there’s a REST-ful, JSON-based API, ready to be used by third parties. All of this is done automatically, quickly, and seamlessly. The time elapsed varies, depending on server power and the length of the legal code, but it generally takes about twenty minutes from start to finish. The State Decoded is a free program, released under the GNU Public License. Anybody can use it to make legal codes more accessible online. There are no strings attached. It has already been deployed in two states, Virginia and Florida, despite not actually being a finished project yet. The striking variations in the structures of legal codes within the U.S. required the establishment of an appropriately flexible system to store and render those codes. Some legal codes are broad and shallow (e.g., Louisiana, Oklahoma), while others are narrow and deep (e.g., Connecticut, Delaware). Some list their sections by natural sort order, some in decimal, a few arbitrarily switch between the two. Many have quirks that will require further work to accommodate. Many state codes have oddities like this. The State Decoded combines flexibility with open source code to make it possible to deal with these quirks on a case-by-case basis. The alternative approach is too convoluted and quixotic to consider. There is strong interest in seeing this software adapted to handle regulations, especially from cash-strapped state governments looking to modernize their regulatory delivery process. Although this process is still in an early stage, it looks like rather few modifications will be required to support the storage and display of regulations within The State Decoded. To find the latest version of a regulation online, a person should first check the table of contents in the most current Kansas Register, then the Index to Regulations in the most current Kansas Register, then the current K.A.R. Supplement, then the Kansas Administrative Regulations. If the regulation is found at any of these sequential steps, stop and consider that version the most recent. If Kansas has electronic versions of all this data, it seems almost punitive not to put it all in one place, rather than forcing people to look in four places. 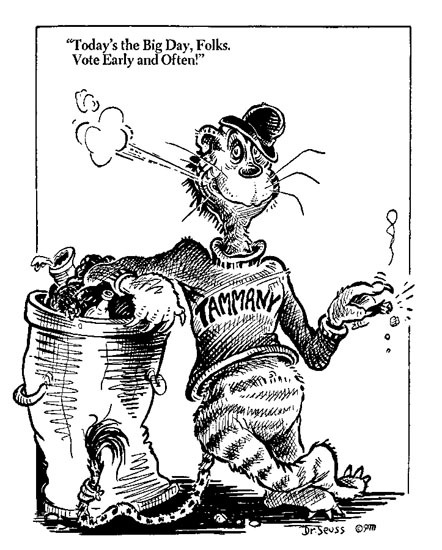 It seems self-evident that the current Kansas Register, the Index to Regulations, the K.A.R. Supplement, and the Kansas Administrative Regulations should have APIs, with a common API atop all four, which would make it trivial to present somebody with the current version of a regulation with a single request. By indexing registers of regulations in the manner that The State Decoded indexes court opinions, it would at least be possible to show people all activity around a given regulation, if not simply show them the present version of it, since surely that is all that most people want. In a way, what makes The State Decoded interesting is not anything that it actually does, but instead what others might do with the data that it emits. By capitalizing on the program’s API and healthy collection of bulk downloads, clever individuals will surely devise uses for state legal data that cannot presently be envisioned. The structural value of state laws is evident when considered within the context of other open government data. Major open government efforts are confined largely to the upper-right quadrant of this diagram – those matters concerned with elections and legislation. There is also some excellent work being done in opening up access to court rulings, indexing scholarly publications, and nascent work in indexing the official opinions of attorneys general. But the latter group cannot be connected to the former group without opening up access to state laws. Courts do not make rulings about bills, of course – it is laws with which they concern themselves. Law journals cite far more laws than they do bills. 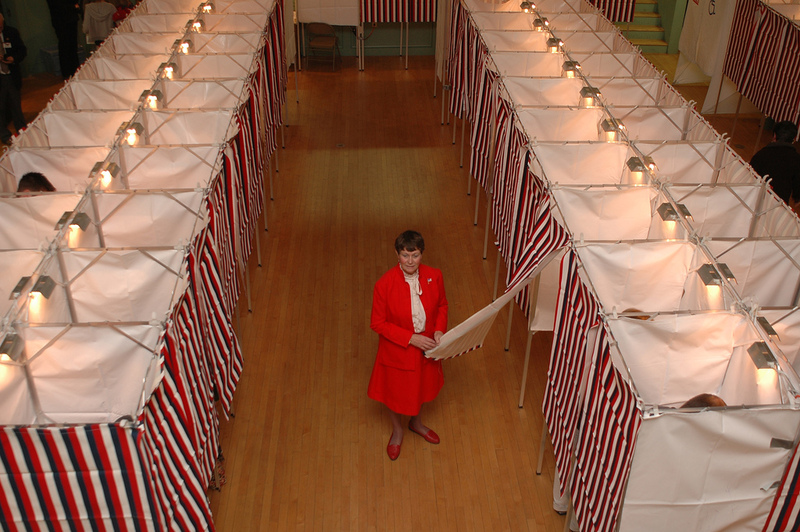 To weave a seamless tapestry of data that connects court decisions to state laws to legislation to election results to campaign contributions, it is necessary to have a source of rich data about state laws. The State Decoded aims to provide that data. The most important next step for The State Decoded is to complete it, releasing a version 1.0 of the software. It has dozens of outstanding issues – both bug fixes and new features – so this process will require some months. In that period, the project will continue to work with individuals and organizations in states throughout the nation who are interested in deploying The State Decoded to help them get started. Ideally, The State Decoded will be obviated by states providing both bulk data and better websites for their codes and regulations. But in the current economic climate, neither are likely to be prioritized within state budgets, so unfortunately there’s liable to remain a need for the data provided by The State Decoded for some years to come. The day when it is rendered useless will be a good day. Waldo Jaquith is a website developer with the Miller Center at the University of Virginia in Charlottesville, Virginia. He is a News Challenge Fellow with the John S. and James L. Knight Foundation and runs Richmond Sunlight, an open legislative service for Virginia. Jaquith previously worked for the White House Office of Science and Technology Policy, for which he developed Ethics.gov, and is now a member of the White House Open Data Working Group. 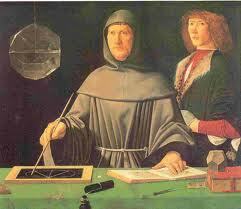 In 1494, Luca Pacioli published “Particularis de Computis et Scripturis,” which is widely regarded as the first written treatise on bookkeeping. In the 600+ years since that event, we have become completely accustomed to the concepts of ledgers, journals and double-entry bookkeeping. Like all profound ideas, the concept of a transaction ledger nowadays seems to be completely natural, as if always existed as some sort of natural law. Whenever there is a need for detailed, defensible records of how a financial state of affairs (such as a company balance sheet or a profit and loss statement) came to be, we employ Pacioli’s concepts without even thinking about them any more. Of course you need ledgers of transactions as the raw material from which to derive the financial state of affairs at whatever chosen point in time is of interest. How else could you possibly do it? Back in Pacioli’s day, there was nothing convenient about ledgers. 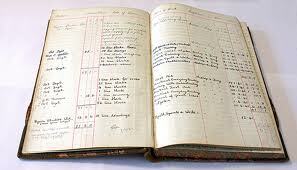 After all, back then, all ledger entries had to be painstakingly made by hand into paper volumes. Care was needed to pair up the debits and credits. Ledger page totals and sub-totals had to checked and re-checked. Very labor intensive stuff. But then computers came along and lo! all the benefits of ledgers in terms of the rigorous audit trail could be enjoyed without all the hard labor. Doubtless, somewhere along the line in the early days of the computerization of financial ledgers, it occurred to somebody that ledger entries need not be immutable. That is to say, there is no technical reason to carry forward the “limitation” that pen and ink imposes on ledger writers, that an entry – once made – cannot be changed without leaving marks on the page that evidence the change. Indeed, bookkeeping has long had the concept of a “contra-entry” to handle the immutability of pen and ink. For example, if a debit of a dollar is made to a ledger by mistake, then another ledger entry is made – this time a credit – for a dollar to counter-balance the mistake while preserving the completeness of the audit-trail. Far from being a limitation of the paper-centric world, the concept of an “append-only” ledger turns out, in my opinion, to be the key to the trustworthiness and transparency of financial statements. Accountants and auditors can take different approaches to how information from the ledgers is grouped/treated, but the ledgers are the ledgers are the ledgers. Any doubt that the various summations accurately reflect the ledgers can readily be checked. Now let us turn to the world of law. Well, law is so much more complicated! Laws are not simple little numerical values that fit nicely into transaction rows either in paper ledgers or in database tables. True, but does it follow that the many benefits of the ledger-centric approach cannot be enjoyed in our modern day digital world where we do not have the paper-centric ledger limitations of fixed size lines to fit our information into? Is the world of legal corpus management really so different from the world of financial accounting? What happens if we look at, say, legal corpus management in a prototypical U.S. legislature, from the perspective of an accountant? What would an accountant see? Well, there is this asset called the statute. That is the “opening balance” inventory of the business in accounting parlance. There is a time concept called a Biennium which is an “accounting period”. All changes to the statute that happen in the accounting period are recorded in the form of bills. bills are basically accounting transactions. The bills are accumulated into a form of ledger typically known as Session Laws. At the end of the accounting period – the Biennium – changes to the statute are rolled forward from the Session Laws into the statute. In accounting parlance, this is the period-end accounting culminating in a new set of opening balances (statute), for the start of the next Biennium. At the start of the Biennium, all the ledger transactions are archived off and a fresh set of ledgers is created; that is, bill numbers/session law numbers are reset, the active Biennium name changes etc. I could go on and on extending the analogy (chamber journals are analogous to board of directors meeting minutes; bill status reporting is analogous to management accounting, etc.) but you get the idea. 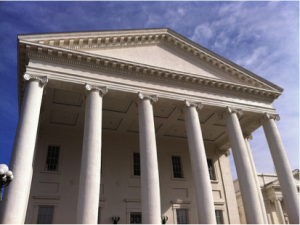 Legal corpus management in a legislature can be conceptualized in accounting terms. Is it useful to do so? I would argue that it is incredibly useful to do so. Thanks to computerization, we do not have to limit the application of Luca Pacioli’s brilliant insight to things that fit neatly into little rows of boxes in paper ledgers. We can treat bills as transactions and record them architecturally as 21st century digital ledger transactions. We can manage statute as a “balance” to be carried forward to the next Biennium. 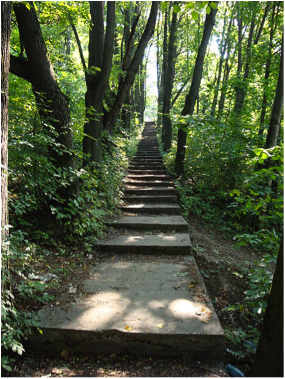 We can treat engrossments of bills and statute alike as forms of trail balance generation and so on. Now I am not for a moment suggesting that a digital legislative architecture be based on any existing accounting system. What I am saying is that the concepts that make up an accounting system can – and I would argue should – be used. A range of compelling benefits accrue from this. A tremendous amount of the back-office work that goes on in many legislatures can be traced back to work-in-progress (WIP) reporting and period-end accounting of what is happening with the legal corpus. Everything from tracking bill status to the engrossment of committee reports becomes significantly easier once all the transactions are recorded in legislative ledgers. The ledgers then becomes the master repository from which all reports are generated. The reduction in overall IT moving parts, reduction in human effort, reduction in latency and the increase in information consistency that can be achieved by doing this is striking. For many hundreds of years we have had ledger-based accounting. For hundreds of years the courts have taken the view that, for example, a company cannot simply announce a Gross Revenue figure to tax officials or to investors, without having the transaction ledgers to back it up. Isn’t in interesting that we do not do the same for the legal corpus? We have all sorts of publishers in the legal world, from public bodies to private sector, who produce legislative outputs that we have to trust because we do not have any convenient form of access to the transaction ledgers. Somewhere along the line, we seem to have convinced ourselves that the level of rigorous audit trail routinely applied in financial accounting cannot be applied to law. This is simply not true. We can and should fix that. The prize is great, the need is great and the time is now. The reason the time is now is that all around us, I see institutions that are ceasing to produce paper copies of critical legal materials in the interests of saving costs and streamlining workflows. I am all in favour of both of these goals, but I am concerned that many of the legal institutions going fully paperless today are doing so without implementing a ledger-based approach to legal corpus management. Without that, the paper versions of everything from registers to regulations to session laws to chamber journals to statute books – for all their flaws – are the nearest thing to an immutable set of ledgers that exist. Take away what little audit trail we have and replace it will a rolling corpus of born digital documents without a comprehensive audit trail of who changed what and when?…Not good. Once an enterprise-level ledger-based approach is utilised, another great prize can be readily won; namely, the creation of a fully digital yet fully authenticated and authoritative corpus of law. To see why, let us step back into the shoes of the accountant for a moment. When computers came along and the financial paper ledgers were replaced with digital ledgers, the world of accounting did not find itself in a crisis concerning authenticity in the way the legal world has. Why so? I would argue that the reason for this is that ledgers – Luca Pacioli’s great gift to the world – are the true source of authenticity for any artifact derived from the ledgers. Digital authenticity of balance sheets or Statute sections does not come from digital signatures or thumb-print readers or any of the modern high tech gadgetry of the IT security landscape. Authenticity come from knowing that what you are looking at was mechanically and deterministically derived from a set of ledgers and that those ledgers are available for inspection. What do financial auditors do for living? They check authenticity of financial statements. How do they do it? They do it by inspecting the ledgers. Why is authenticity of legal materials such a tough nut to crack? Because there are typically no ledgers! From time to time we hear an outburst of emotion about the state of the legal corpus. From time to time we hear how some off-the-shelf widget will fix the problem. Technology absolutely holds the solutions, but it can only work, in my opinion, when the problem of legal corpus management is conceptualized as ledger-centric problem where we put manic focus on the audit trail. Then, and only then, can we put the legal corpus on a rigorous digital footing and move forward to a fully paperless world with confidence. From time to time, we hear an outburst of enthusiasm to create standards for legal materials and solve our problems that way. I am all in favour of standards but we need to be smart about what we standardize. Finding common ground in the industry for representing legislative ledgers would be an excellent place to start, in my opinion. Is this something that some standards body such as OASIS or NIEM might take on? I would hope so and hopeful that it will happen at some point. Part of why I am hopeful is that I see an increasing recognition of the value of ledger-based approaches in the broader world of GRC (Governance, Risk and Compliance). For too long now, the world of law has existed on the periphery of the information sciences. It can, and should be, an exemplar of how a critical piece of societal infrastructure has fully embraced what it means to be “born digital”. We have known conceptually how to do it since 1494. The technology all exists today to make it happen. A number of examples already exist in production use in legislatures in Europe and in the USA. What is needed now, is for the idea to spread like wildfire the same way that Pacioli’s ideas spread like wildfire into the world of finance all those years ago. Perhaps some day, when the ledger-centric approach to legal corpus management had removed doubts about authenticity/reliability, we will look back and think digital law was always done with ledgers, just as today we think that accounting was always done that way. Sean McGrath is co-founder and CTO of Propylon, based in Lawrence, Kansas. 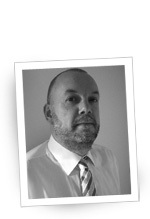 He has 30 years of experience in the IT industry, most of it in the legal and regulatory publishing space. He holds a first class honors degree in Computer Science from Trinity College Dublin and served as an invited expert to the W3C special interest group that created the XML standard in 1996. He is the author of three books on markup languages published by Prentice Hall in the Dr Charles F. Goldfarb Series on Open Information Management. He is a regular speaker at industry conferences and runs a technology-oriented blog at http://seanmcgrath.blogspot.com. At my organization, the Sunlight Foundation, we follow the rules. I don’t just mean that we obey the law — we literally track the law from inception to enactment to enforcement. After all, we are a non-partisan advocacy group dedicated to increasing government transparency, so we have to do this if we mean to serve one of our main functions: creating and guarding good laws, and stopping or amending bad ones. One of the laws we work to protect is the Freedom of Information Act. Last year, after a Supreme Court ruling provided Congress with motivation to broaden the FOIA’s exemption clauses, we wanted to catch any attempts to do this as soon as they were made. As many reading this blog will know, one powerful way to watch for changes to existing law is to look for mentions of where that law has been codified in the United States Code. In the case of the FOIA, it’s placed at 5 U.S.C. § 552. 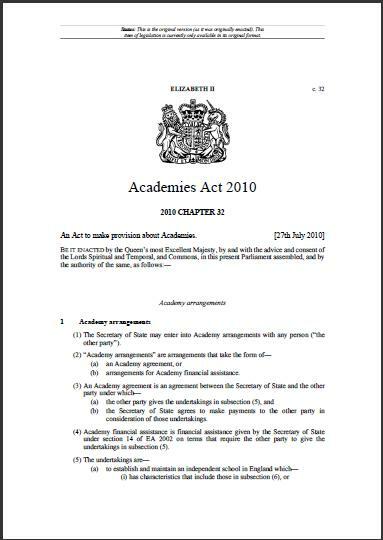 So, what we wanted was a system that would automatically sift through the full text of all legislation, as soon as it was introduced or revised, and email us if such a citation appeared. With modern web technology, and the fact that the Government Printing Office publishes nearly every bill in Congress in XML, this was actually a fairly straightforward thing to build internally. In fact, it was so straightforward that the next question felt obvious: why not do this for more kinds of information, and make it available freely to the public? That’s why we built Scout, our search and notification system for government action. Scout searches the bills and speeches of Congress, and every federal regulation as they’re drafted and proposed. Through the awe-tacular power of our Open States project, Scout also tracks legislation as it emerges in statehouses all over the country. It offers simple and advanced search operators, and any search can be turned into an email alert or an RSS feed. If your search turns up a bill worth following, you can subscribe to bill-specific alerts, like when a vote on it is coming up. This has practical applications for, really, just about everyone. If you care about an issue, be it as an environmental activist, a hunting enthusiast, a high (or low) powered lawyer, or a government affairs director for a company – finding needles in the giant haystack of government is a vital function. Since launching, Scout’s been used by thousands of people from a wide variety of backgrounds, by professionals and ordinary citizens alike. Search and notifications are simple stuff, but simple can be powerful. Soon after Scout was operational, our original FOIA exemption alerts, keyed to mentions of 5 U.S.C. § 552, tipped us off to a proposal that any information a government passed to the Food and Drug Administration be given blanket immunity to FOIA if the passing government requested it. If that sounds crazily broad, that’s because it is, and when we in turn passed this information onto the public interest groups who’d helped negotiate the legislation, they too were shocked. As is so often the case, the bill had been negotiated for 18 months behind closed doors, the provision was inserted immediately and anonymously before formal introduction, and was scheduled for a vote as soon as Senate processes would allow. Because of Scout’s advance warning, there was just barely enough time to get the provision amended to something far narrower, through a unanimous floor vote hours before final passage. Without it, it’s entirely possible the provision would not have been noticed, much less changed. This is the power of information; it’s why many newspapers, lobbying shops, law firms, and even government offices themselves pay good money for services like this. We believe everyone should have access to basic political intelligence, and are proud to offer something for free that levels the playing field even a little. Of particular interest to the readers of this blog is that, since we understand the value of searching for legal citations, we’ve gone the extra mile to make US Code citation searches extra smart. If you search on Scout for a phrase that looks like a citation, such as “section 552 of title 5”, we’ll find and highlight that citation in any form, even if it’s worded differently or referencing a subsection (such as “5 U.S.C. 552(b)(3)”). If you’re curious about how we do this, check out our open source citation extraction engine – and feel free to help make it better! It’s worth emphasizing that all of this is possible because of publicly available government information. 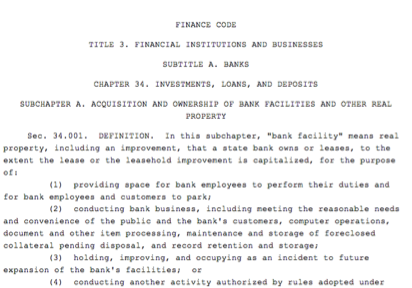 In 2012, our legislative branch (particularly GPO and the House Clerk) and executive branch (particularly the Federal Register) provide a wealth of foundational information, and in open, machine-readable formats. Our code for processing it and making it available in Scout is all public and open source. Anyone reading this blog is probably familiar with how easily legal information, even when ostensibly in the public domain, can be held back from public access. The judicial branch is particularly badly afflicted by this, where access to legal documents and data is dominated by an oligopoly of pay services both official (PACER) and private-sector (Westlaw, LexisNexis). It’s easy to argue that legal information is arcane and boring to the everyday person, and that the only people who actually understand the law work at a place with the money to buy access to it. It’s also easy to see that as it stands now, this is a self-fulfilling prophecy. If this information is worth this much money, services that gate it amplify the political privilege and advantage that money brings. The Sunlight Foundation stands for the idea that when government information is made public, no matter how arcane, it opens the door for that information to be made accessible and compelling to a broader swathe of our democracy than any one of us imagines. We hope that through Scout, and other projects like Open States and Capitol Words, we’re demonstrating a few important reasons to believe that. Eric Mill is a software developer and international program officer for the Sunlight Foundation. He works on a number of Sunlight’s applications and data services, including Scout and the Congress app for Android. 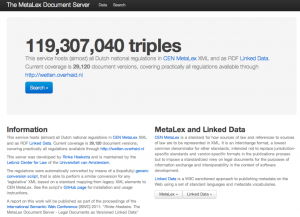 In this post I describe the process and requirements that eventually led to the MetaLex Document Server, a server that hosts all versions of Dutch national statutes and regulations published since May 2011, both as CEN MetaLex, and as Linked Data. Before I set out to do so, however, I would like to emphasize that, although the development of the server and its contents was a one-man-job, the road to make it possible surely was not solitary. A couple of people I’d like to mention here are Alexander Boer, Radboud Winkels, and Tom van Engers of the Leibniz Center for Law, together with whom I have worked over the past ten years to develop, test, and publish the ideas that underlie CEN MetaLex. 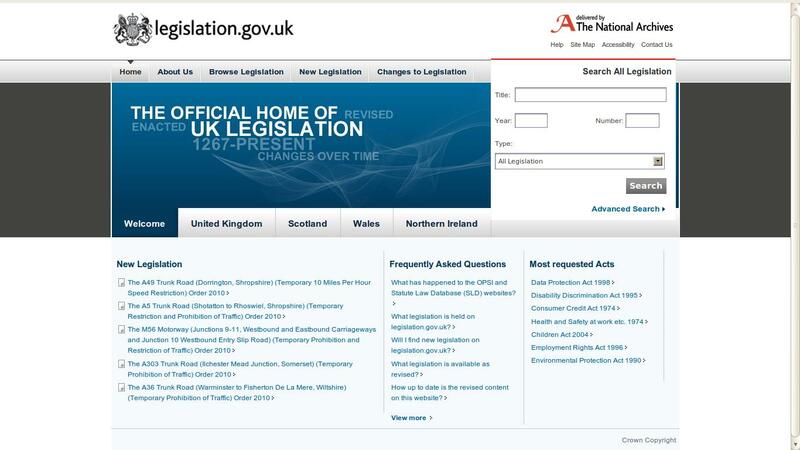 Also, the team around legislation.gov.uk clearly has done a lot of great and inspiring work in this area. So, what happened? 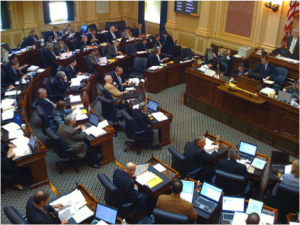 Over the course of last spring, I was involved in several small-scale projects that shared a specific need: version-aware identifiers for all parts of legislative texts. The first of these was a report for the Swiss Federal Chancellery on possible technological solutions for a regulation drafting system to be used by the Swiss government. Second to arrive on my desk was a project for the Dutch Tax and Customs Administration (Belastingdienst), in which we were asked to develop a concept-extraction toolkit that would allow them to make explicit where concepts are defined, where they are reused, and how they relate to other concepts (e.g., from an external thesaurus). The purpose of this project was to investigate whether we could replace with technology what is currently a manual process of turning legislation into business processes that fuel citizen- and business-oriented services. The Belastingdienst needs this to better cope with the yearly changes to tax regulation issued by the Ministry of Finance. The Dutch Immigration and Naturalisation Service (IND) faces exactly the same problem: of discovering what part of their business processes is affected by each legislative modification. Updates to legislation require continuous, significant investment in IT re-engineering. But don’t modern European governments already have elaborate facilities for supporting this workflow? I’m afraid not. Currently, regulation drafting is a process of sending around Word documents, copy-and-pasting from older texts, “version hell,” signing by a Minister, and sending the enacted regulations off to a publisher, who will then turn it into some XML format to feed a publishing platform to generate HTML, PDF, and paper versions of the texts. This process is not designed with a content management perspective, and most if not all metadata is thrown away in the process. Part of the problem is one of organisational change: convincing legislative drafters to use a more structured approach in their daily work. The Dutch Ministry of Security and Justice is currently developing a legislative editing environment (similar to the MetaVex editor developed at the University of Amsterdam), but it will take awhile before this is adopted in practice. An integrated legislative drafting and editing environment that supports advanced version and provenance tracking (e.g., version tracking of successive changes to draft texts). Provenance information is very important for eliciting the procedure that led to an official version (both pre- and post-publication), as well as its underlying motivation. A format in which these texts are stored that is flexible enough to allow both editing and publication to various formats (such as PDF and HTML). The ability to persistently identify every element of a legal text. Versioning of texts, references, and metadata requires identifiers that reflect the different versions of these resources. The various parts of a text should be versioned independently, allowing for transitory regimes. A versioning mechanism should distinguish between a regulation text as it exists at a particular time, and the final regulation. The IFLA Functional Requirements for Bibliographic Records (FRBR) (Saur, ’98) makes the following distinctions: the work as a “distinguishable intellectual or artistic creation” (e.g., the constitution); the expression as the “intellectual or artistic form that a work takes each time it is realised” (e.g., “The Constitution of July 15th, 2008”); the manifestation as the “physical embodiment of an expression of a work” (e.g., a PDF version of “The Constitution of July 15th, 2008”); and the item as a “single exemplar of a manifestation” (e.g., the PDF version of “The Constitution of July 15th, 2008” residing on my USB stick). These identifiers should be dereferenceable to the element they describe, or a description of the element’s metadata. Metadata and annotations should be traceable to the most detailed part of a text, as well as to its version, when needed. The same requirement holds for references between texts, allowing for fine-grained analysis of interdependencies between texts. It is furthermore a requirement that these identifiers be transparent and follow a prescribed naming convention. This allows third parties to construct valid identifiers without having to first query a name service. The metadata itself should be made accessible in a standard format as well. As we don’t have any time to waste, and have neither the organisational infrastructure, nor the funds, to use or develop any other (richer) information source, we need to make do with what’s currently available. How hard is it to build a chain of tools that meets at least part of these requirements? And, what information does the Dutch government already provide on which we can build the services that it itself so dearly needs? Wetten.overheid.nl is the de facto source for legislative information in The Netherlands. 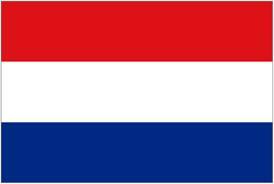 Users can perform a full text search through the titles and text of all statutes and regulations of the Kingdom of the Netherlands. They can search for a specific article, as well as for the version of a text as it stood at a specified date. Wetten.overheid.nl also provides an API for retrieving XML manifestations of statutes and regulations. But… the standard does not prescribe a mechanism for dereferenecing an identifier to the actual text of (part of) a statute or regulation. XML manifestations of statutes and regulations are retrievable through an API on top of the “Basiswettenbestand” (BWB) content management system. This REST Web service only provides the latest version of an entire statute or regulation. The BWB XML document returned is stripped of all version history: it does not even contain the version date of the text itself. 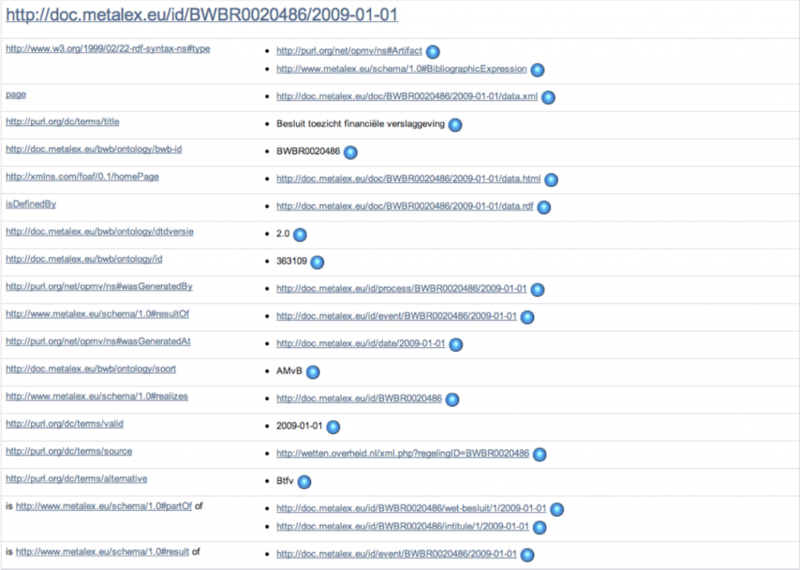 An index of all BWB identifiers, with basic attributes such as official and abbreviated titles, enactment and publication dates, retroactivity, etc. is available as a zipped XML dump or a SOAP service. Unfortunately, the XML file is corrupt, and the date of the latest change to a statute or regulation reported in the index is not really the date of the latest modification, but of the latest update of the statute or regulation in the CMS. See the picture above. The BWB uses its own XML schema for storing statutes and regulations; this schema does not allow for intermixing with any third-party elements or attributes, ruling out obvious extensions for rich annotations such as RDFa. And, BWB XML elements do not carry any identifiers. CEN MetaLex is a jurisdiction-independent XML format for representing, publishing, and interchanging legal texts. It was developed to allow traceability of legal knowledge representations to their original source. MetaLex elements are purely structural. Syntactic elements (structure) are strictly distinct from the meaning of elements by specifying for each element a name and its content model. What this essentially does is to pave the way for a semantic description of the types of content of elements in an XML document. The standard prescribes the existence of a naming convention for minting URI-based identifiers for all structural elements of a legal document. MetaLex explicitly encourages the use of RDFa attributes on its elements, and provides special metadata-elements for serialising additional RDF triples that cannot be expressed on structural elements themselves. 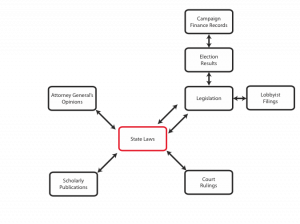 MetaLex includes an ontology, which defines an event model for legislative modifications. The legislation.gov.uk portal has adopted the MetaLex event model for representing modifications. The MetaLex schema is designed to be independent of jurisdiction, which means that it should be possible to map each legacy XML element to a MetaLex element in an unambiguous fashion. Fortunately, we were able to define a straightforward 1:n mapping between BWB and MetaLex (see below) by a semi-automatic conversion of the BWB XML DTD. For the transformation of BWB XML files, the converter is sequentially fed with all BWB XML files and identifiers listed in the BWB ID index. Based on the mapping table, the converter traverses the DOM tree of the source document, and synchronously builds a DOM tree for the target document. In cases where the MetaLex schema doesn’t quite “fit,” the converter has to make additional repairs. 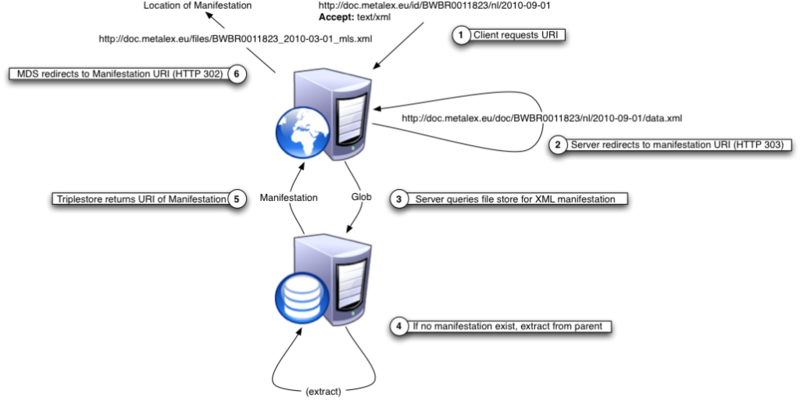 We evaluated the ability of MetaLex to map onto the BWB XML by running the converter on 300 randomly selected BWB identifiers. The artikel element accounts for 72% of all corrections, and corresponds to 68% of all htitle substitutions (5 % of total). This means that only a very small part of BWB XML does not directly fit onto the MetaLex schema. The main cause for incompatibility is the restriction in MetaLex that hcontainer elements are not allowed to contain block elements (and that’s perhaps something to consider for the MetaLex workshop). Because of the limitations of the API, version information, citation titles, and other metadata are retrieved through a custom-built scraper of the information pages on the wetten.nl Website. For every element in the document we create transparent URL-like URIs for the work, expression and manifestation levels, and two opaque URIs for the expression and item levels in the FRBR specification. For transparent URIs, we use a naming scheme that is based on the URIs used at legislation.gov.uk, with slight adaptations to allow for the Dutch situation. In short, work level identifiers are based on the standard BWB identifier, followed by a hierarchical path to an element in the source, e.g., “chapter/1/article/1”. These URIs are extended to expression URIs by appending version and language information. Similarly, manifestation URIs are extensions of expression URIs that specify format information such as XML, RDF, etc. Juriconnect references in the source BWB XML are automatically translated to this naming scheme. The opaque version URI is needed to distinguish different versions of a text. The current Webservice does not provide access to all versions of statutes and regulations (only to the latest), let alone at a level of granularity lower than entire statutes or regulations. We therefore need some way of constructing a version history by regularly checking for new versions, and comparing them to those we looked at before. By including in the opaque URI a unique SHA1 hash of the textual content of an XML element, and simultaneously maintaining a link between the opaque URI and the transparent identifier, different expressions of a work can be automatically distinguished through time. This is needed to work around issues with identifiers based on numbers: the insertion of a new element can change the position (and therefore the identifier) of other elements without a change in the content of the elements. By this method, globally persistent URIs of every element in a legal text can be consistently generated for both current and future versions of the text. By simultaneously generating an opaque and a transparent expression level URI, identification of these text versions does not have to rely on numbering. The MetaLex converter produces three types of metadata. First, legacy metadata from attributes in the source XML is directly translated to RDF triples. Second, metadata describing the structural and identity relations between elements is created. This includes typing resources according to the MetaLex ontology, e.g., as ml:BibliographicExpression; creating ml:realizes relations between expressions and works; and creating owl:sameAs relations between opaque and transparent expression URIs. The official title, abbreviation, and publication date of statutes and regulations are represented using the dcterms:title, dcterms:alternative and dct:valid properties. Event information plays a central role in determining what version of a regulation was valid when. Making explicit which events and modifying processes contributed to an expression of a regulation provides for a flexible and extensible model. The MDS uses the MetaLex ontology for legislative modification events, the Simple Event Model (SEM) and the W3C Time Ontology for an abstract description of events and event types, and the Open Provenance Model Vocabulary (OPMV) for describing processes and provenance information. These vocabularies can be combined in a compatible fashion, allowing for maximal reuse of event and process descriptions by third parties that may not necessarily commit to the MetaLex ontology. The MetaLex converter supports three formats for serialising a legal text to a manifestation: the MetaLex format itself, viewable in a browser by linking a CSS stylesheet; RDFa, Turtle and RDF/XML serializations of the RDF metadata; and a citation graph. The converter can automatically upload RDF to a triple store through either the Sesame API, or SPARQL updates. The citation graph is exported as a ‘”net” network file, for further analysis in social network software tools such as Pajek and Gephi. We are exploring ways to use these networks for determining the importance of articles (in degree) and the dependency of legislation on certain articles (betweenness centrality), and for analysing the correlation between legislation and case law. The results of this procedure are published through the MetaLex Document Server (MDS). The server follows the Cool URIs specification, and implements HTTP-based redirects for work- and expression-level URIs to corresponding manifestations based on the HTTP accept header. Requests for an HTML mime-type are redirected to a Marbles HTML rendering of a Symmetric Concise Bounded Description (SCBD) of the RDF resource. Similarly, requests for RDF content return the SCBD itself; supported formats are RDF/XML and Turtle. A request for XML will return a snippet of MetaLex for the specified part of a statute or regulation. The MDS provides two convenient methods for retrieving manifestations of a statute or regulation. Appending “/latest” to a work URI will redirect to the latest expression present in the triple store. Appending an arbitrary ISO date will return the last expression published before that date if no direct match is available. Lastly, the MDS offers a simple search interface for finding statutes and regulations based on the title and version date. We have been running the converter on a daily basis, on all versions of statutes and regulations made available through the wetten.nl portal since May 2011. This has resulted in a current total of 29,120 document versions: 28 thousand versions in the first run, the rest accumulated through time. 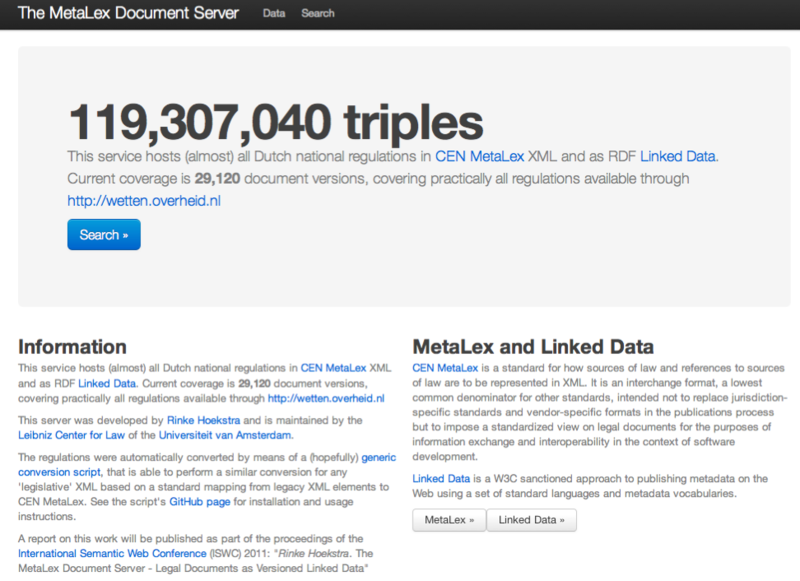 For these document versions, we now store 119 million triples of RDF metadata in a 4Store triple store. Compared to the size of legislation.gov.uk (1.9 billion triples, since the 1200s), this is a modest number, but at the current growth rate we will soon need to look for alternative (more professional) solutions. Check the http://doc.metalex.eu Website for the latest numbers. I am happy to say, also, that this work has not gone unnoticed. The IND was particularly enthused by the versioning mechanism, and is in the process of adopting the MDS approach as their internal content management system. Similarly, the ability to link concept descriptions to reliably versioned parts of legislation has been an eye opener for the Belastingdienst. We are also in touch with several people at ICTU, the organisation behind Wetten.nl, to help them improve their services. 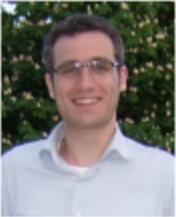 Dr. Rinke Hoekstra is a postdoctoral researcher at the Leibniz Center for Law at the University of Amsterdam. He is the developer of the MetaLex Document Server, the principal author of the LKIF Core ontology of basic legal concepts, and one of the initial developers of the MetaLex XML format for legal sources. This post is divided into three topical sections. 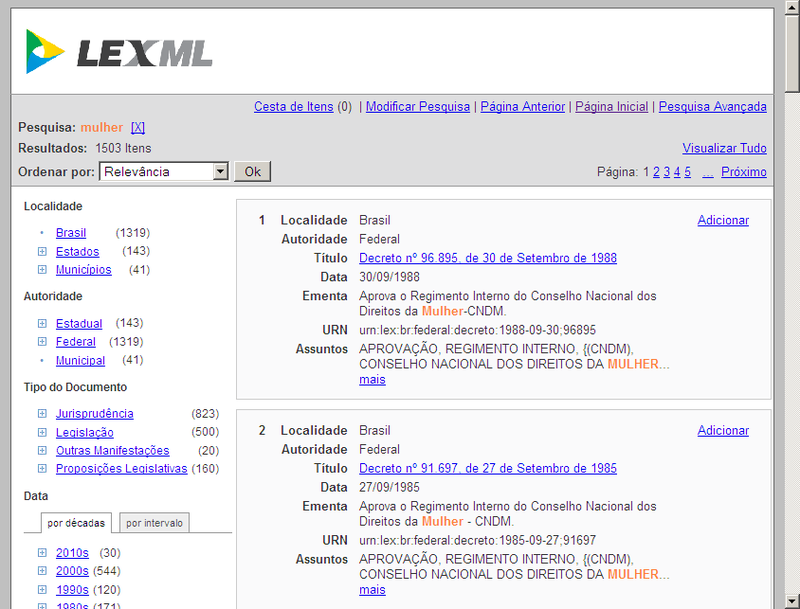 The first one is an introduction to the LexML Brazil Project and its unified search portal, after which some aspects related to semantic interoperability shall be presented and, at the end, we show the current work and future direction of the project. Before going on to the aforementioned subjects, a few words about Brazil and its legislative and legal systems are necessary. 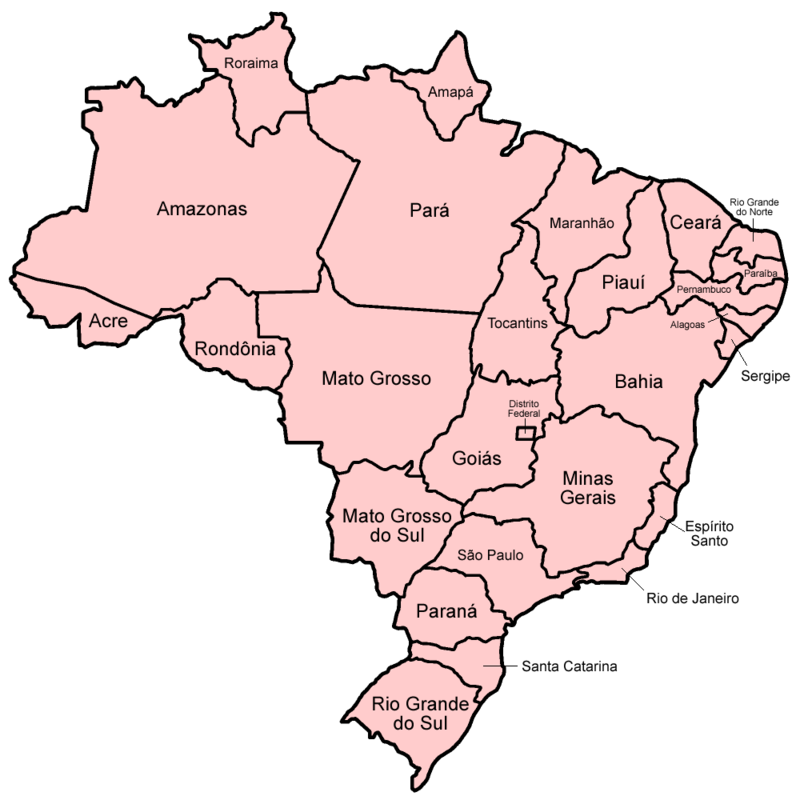 Brazil is a country of continental proportions, composed of 27 states and more than five thousand municipalities, or cities, as in Brazil no distinction is made between town and city. As a federative system, each state and municipality has its own legislative chamber. While states and cities follow a unicameral system, the Federation itself has a bicameral system, with the National Congress divided into a Chamber of Deputies and the Federal Senate. These legislatures generate a great number of laws, or normative acts. The abundance of normative acts is very significant, considering that, in contrast with Common Law systems, Brazil’s legal system, based on the Civil Law, is characterized by the predominance of normative acts. 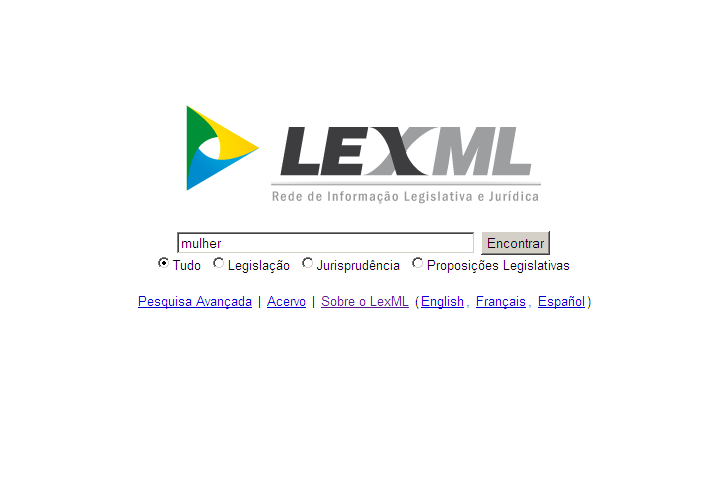 Born to address these issues, LexML Brazil is an information network that aims to organize Brazil’s legislative and legal information. The project is an initiative of the “Comunidade TI Controle” (IT Control Community) and is being implemented by the Brazilian Federal Senate, through PRODASEN (the Senate’s special secretariat for information systems) and Interlegis (a virtual community of Brazilian legislatures). 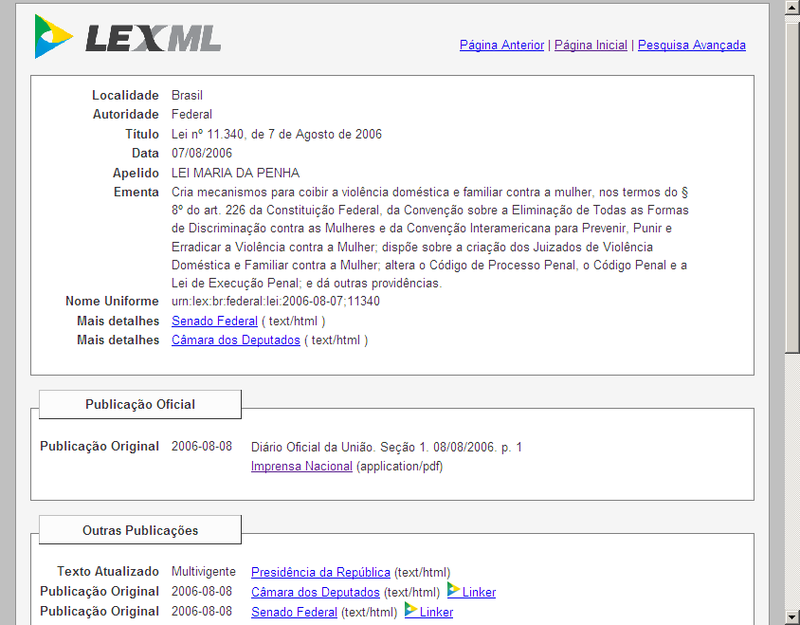 LexML Brazil’s first product is the Legislative and Legal Information Portal, which opened on June 30, 2009, indexing 1.28 million documents. In September 2010, its index ranged through more than 1.5 million documents. By indexing the metadata collected from several institutions using the OAI-PMH protocol, the portal unifies access to a variety of legislative and legal information sources, which is a step toward the goal of guaranteeing Brazilians’ constitutional right of access to information. The LexML Portal home page layout is very simple and is similar to Google‘s main page. 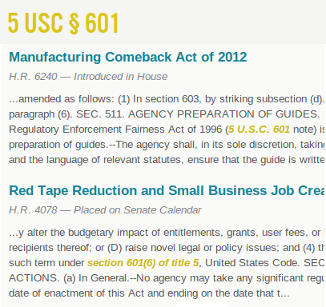 At this screen, it is possible to restrict the search to Legislation, Jurisprudence, or Bills. The search results page allows the user to refine the search by using filters, according to his or her information requirements. Five filters are available: location, issuing authority, document type, date, and acronyms. The detail page provides links to the official publication version of each document, and to other publications available in information systems of network participants, which, in this particular case, are: National Press, Presidency, Chamber of Deputies, and Federal Senate. General information about the document is available by clicking one of “Mais Detalhes (More details)” links, which directs the Web browser to the corresponding network participant’s metadata page. A service providing automatic identification of textual references can be activated by clicking the “Linker” label. While systems interoperability and syntactic issues can be managed with the estabilished standards of representation, codification, and exchange (XML, METS, Unicode, OAI-PMH, etc. ), structural and semantic interoperability demands the adoption of a reference model that allows the integration of several models and the use of a unified terminology for indexing different sources of information. According to Patel et al., the general purpose of semantic interoperability is “to support complex and advanced context-sensitive query processing over heterogeneous information resources.” Lack of semantic interoperability generates then the “information silos” problem, characterized by the lack of information integration and consequent inability to process complex queries. The next section presents the design choices made by the LexML Brazil Project to address issues related to semantic interoperability using Ranganathan‘s “stratification planes” classification system, featuring: an idea plane, a verbal plane, and a notational plane. The idea plane is composed of the abstract entities of a domain, independently of how they are nominated or identified. The metadata standards that propose to address interoperability issues do so either for a specific, restricted domain or for heterogeneous domains. Specialized metadata standards (MARC, EAD, MODS, etc.) allow different sources of information about specific domains (bibliographical or archival information) to be integrated and searched in an advanced form. On the other hand, the Dublin Core standard is one of the few that try to integrate arbitrarily heterogeneous sources using a minimum set of elements and qualifiers. Its characteristic simplicity enables easy adoption by multiple actors, but also hinders query processing, preventing the use of the rich chain of relationships among entities. The lack of generality or expressiveness of these standards precludes their use for achieving semantic interoperability of heterogeneous sources of legislative and legal information in Brazil. An alternative is to use formal ontologies instead of metadata standards. According to Martin Doerr, “recently, more and more projects and theoreticians support the use of formal ontologies as common conceptual schema for information integration.” One such ontology, the CIDOC CRM model, was designed to help the integration, mediation, and interchange of heterogeneous cultural heritage information. It was developed in 1994 and has since been approved as the ISO 21127:2006 standard. The CIDOC CRM model is then a natural choice for conceptual schemas of legal and legislative information, if one considers that the text corpus consisting of a nation’s sources of law is a part of the nation’s cultural heritage information. However, the CIDOC CRM “document” concept lacks the necessary detail needed to describe the relationships among the several information abstraction levels: work, expression, manifestation, and item. That requirement is fulfilled by the FRBRER entity-relationship model, which was considered as a reference model in earlier phases of the project (“An Adaptation of the FRBR Model to Legal Norms,” João Lima, Proceedings of the V Legislative XML Workshop, Florence, 2005) . The FRBROO standard, an ontology created by a working group formed in 2003 by representatives of IFLA (International Federation of Library Associations and Institutions) and ICOM (International Council of Museums) for purposes of harmonizing both models, was adopted by the LexML project because it combines the advantages of both models while addressing their shortcomings. As such, FRBROO manifests a great affinity to the LexML domain (“A Time-aware Ontology for Legal Resources,” João Lima et al., Proceedings of the Tenth International ISKO Conference, 2008). One of the great innovations of the CIDOC CRM model is the information structuring around temporal events, a central concept in the model. This contrasts with most other metadata models, which have resources as the central objects of interest. 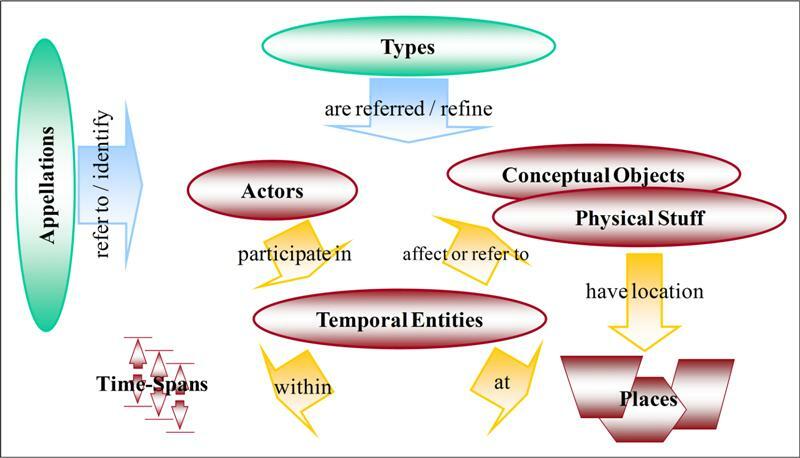 This innovative approach defines events as entities that connect actors, things (concrete and abstract), places, and time intervals. This particular emphasis could be criticized on the ground that the user is generally interested in a specific resource, such as the text of a law. However, the result of a search for information about a law is much more relevant if it includes an organized list of events related to the resource, along with the resource itself. The importance of choosing a suitable reference model is easily observable in the present discussion about what particular syntax to use to codify persistent identifiers — urn:lex, LegisLink, Akoma Ntoso, etc. Before reaching the syntax level, such discussions should focus first on the idea plane, where a greater potential for integration exists. A consensus reached at this level would allow great flexibility for the specification of diverse persistent identifier syntaxes. The CIDOC CRM ontology separates the class of types and denominations from other classes. Multiple names, identifiers, and types can be attributed to all entities of the CRM, allowing any domain class to be classified by several taxonomies and be known by multiple names and identifiers. This approach is used in LexML to represent different terms that identify the same concepts. Six classes form LexML’s uniform resource identifiers: place, authority, type of document, event, type of content, and language. To externalize the LexML vocabularies specification, we recommend, and use, the W3C SKOS (Simple Knowledge Organization System). The definition of uniform and persistent identifiers is fundamental for the creation and maintenance of an information chain. Identifiers are already part of the legal domain. For identification purposes, numbers are attributed to rulings, decisions, abridgments, and bills, allowing references by means of textual remissions. In the computational environment, the creation of persistent and uniform identifiers allows not only identification and reference, but also access to documents by means of textual hyperlinks. Based on the experience of the Italian project Norme in Rete with respect to URN (Uniform Resource Name) identifiers, LexML defines a grammar for the construction of identifiers for legislative and legal documents in Brazil. As an example, the name “urn:lex:br:federal:lei:1993-06-21;8666” identifies, in a persistent and unique way, the “Federal Act No. 8666, of June 21, 1993.” If all information systems agree with respect to the identifiers, it is possible to share descriptive metadata, as well as information about semantic relationships, such as regulation, amendment, abrogation, etc. The Linker service, accessible through the LexML Portal (see, e.g., Act 11.705 without linker and Act 11.705 with linker), creates hyperlinks automatically through a dynamic textual analysis that identifies textual remissions of [i.e., citations to] normative documents. These hyperlinks can be used to navigate through textual remissions. LexML 1.0 consists of the Search Portal, the Resolution Service, the Persistent Identifier, and the Linker Service. The next version, LexML 2.0, will go further: it will involve the development of open source tools for managing the complete text of documents encoded according to the LexML Brazil XML Schema, which was derived from the schemas of the Akoma Ntoso Project. The complete management of document texts in a structured form has been a goal of the project since its inception. 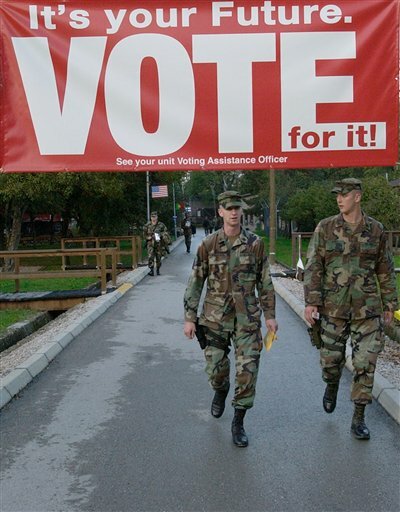 In as early as 2000, the Federal Constitution Portal was implemented following this idea. This portal allows the user to see all the versions of the constitutional text through a timeline, with the option to see the list of historical changes [see, e.g., art. 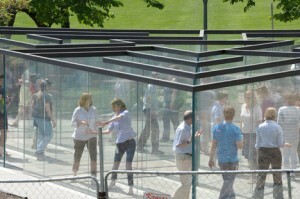 12] and with the ability to navigate bi-directional links [for example, in art. 154, click on the blue arrows]. During the development of that portal, taking into account the various forms of XML used to encode normative texts in many countries, and especially the experience of the Italian project Norme in Rete, a decision was made to make a unified portal and a persistent identifier a priority of the LexML project. Presently, our efforts to build open source tools for management of document texts are being renewed. One of these tools, a LexML Document Editor, will enable the authoring of legal texts as if using a word processor, but producing a structured document at the end. Another tool is the Compiler, which will semi-automatically generate modified versions of documents that have been updated by other legal acts. The Consolidator will help to simplify the display of legal information — and users’ experience of the legal system — through the consolidation of several related normative acts into a single act. The Comparator will be used to display the differences between versions of a document. The last tool, the Publisher, will be used to render XML content in different formats, such as html, PDF, PDF-A, EPUB, etc., with the ability to choose different views of the same text, such as the original text, the updated text as of a specific date, etc. Last but not least, the Information Management Committee, which is a community of practice composed of librarians, archivists, and information analysts of several institutions of the three Brazilian governmental branches, interested in the management of legal and legislative information, is responsible for the definition of the priority and long range planning of the LexML Brazil Project. The LexML Brazil core team, from left to right: João Lima (joaolima at senado.gov.br) is the leader of The LexML Project. His Information Science Ph.D. thesis details many of the concepts presented here; João Holanda (jholanda at senado.gov.br) holds a BSc in History from UnB; João Rafael (jrafael at senado.gov.br) holds a MSc in Computer Science from UFMG and a BSc in Computer Science from UnB; Marcos Fragomeni (fragomeni at senado.gov.br) holds a BSc in Computer Science from UnB. More importantly, “deep” links to internal locations (often called “subdivisions” or “segments”) within a legislative document (the citations within the law, such as section 246 of bill H.R. 3200) are often not supported, or are non-intuitive for users to create or use. 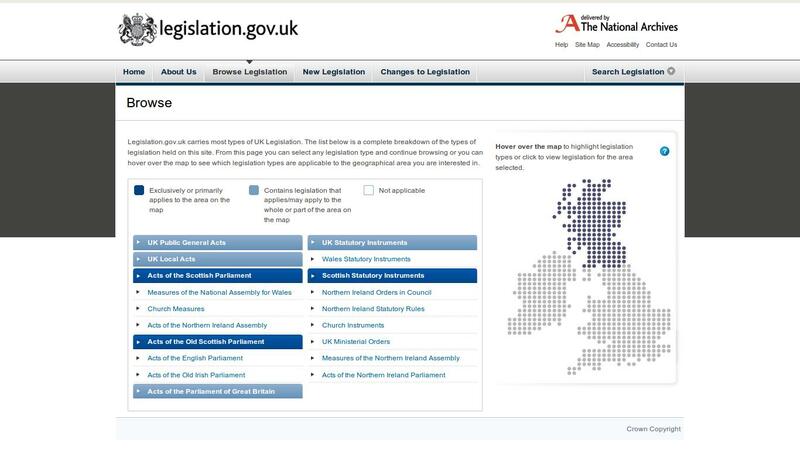 For most legislative Websites, users must click through or fill out forms and then scroll or search for the specific location in the text of legislation. This makes it difficult if not impossible to create and share links to official citations. 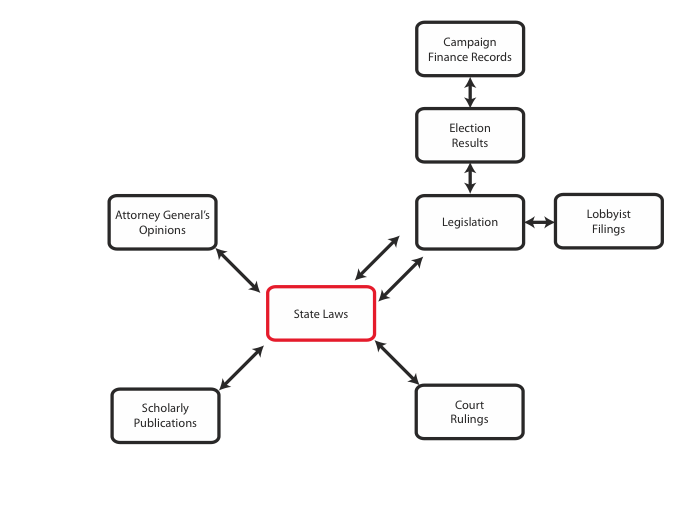 Enabling internal links to subdivisions of legislative documents is crucial, because in most situations, users of legal information need access only to a subdivision of a legal document, not to the entire document. 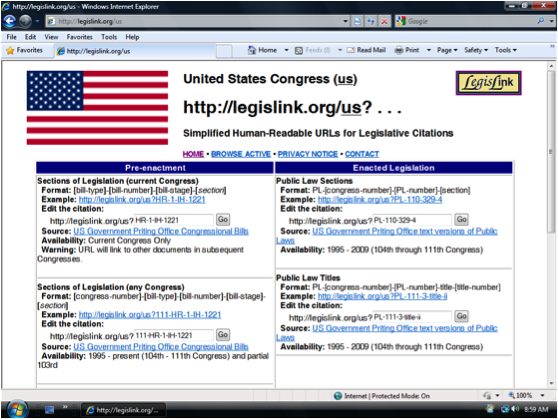 LegisLink.org is a URL Redirection Service with the goal of enabling Internet access to legislative material using citation-based URLs rather than requiring users to repeatedly click and scroll through documents to arrive at a destination. Let’s say you’re reading an article at CNN.com and the article references section 246 in H.R. 3200. If you want to read the section, you can search for H.R. 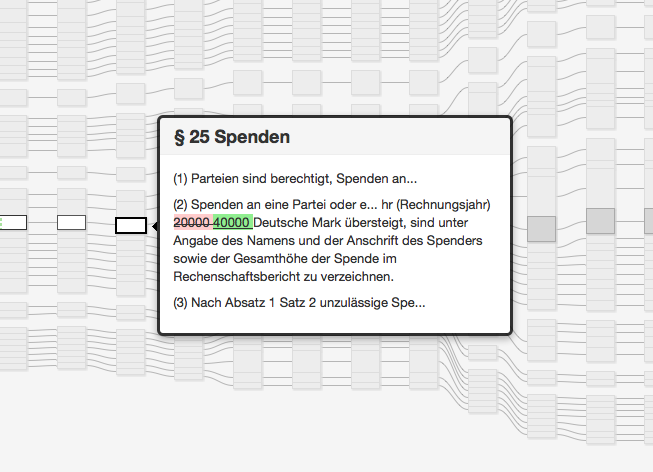 3200 and more than likely you will find the bill and then scroll to find the desired section. On the other hand, you can use something like LegisLink by typing the correct URL. For example: http://legislink.org/us/hr-3200-ih-246. There are several advantages of having a Web service that resolves legislative and legal citations. (1) LegisLink provides links to citations that are otherwise not easy for users to create. In order to create a hyperlink to a location in an HTML or XML file, the publisher must include unique anchor or id attributes within their files. Even if these attributes are included, they are often not exposed as links for Internet users to re-use. On the other hand, Web-based software can easily scan a file’s text to find a requested citation and then redirect the user to the requested location. For PDF files, it is possible to create hyperlinks to specific pages and locations when using the Acrobat plug-in from Adobe. In these cases, hyperlinks can direct the user to the document location at the official Website. In cases where governments have not included ids in HTML, XML or TXT files, LegisLink can replicate a government document on the LegisLink site, insert an anchor, and then redirect the user to the requested location. (2) LegisLink makes it easy to get to a specific location in a document, which saves time. Law students and presumably all law professionals are relying on online resources to a greater extent than ever before. In 2004, Stanford Law School published the results of their survey that found that 93% of first year law students used online resources for legal research at least 80% of the time. (3) Creating and maintaining a .org site that acts as an umbrella for all jurisdictions makes it easier to locate documents and citations, especially when they have been issued by a jurisdiction with which one is unfamiliar. 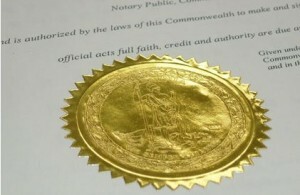 Legislation and other legal documents tend to reside at multiple Websites within a jurisdiction. 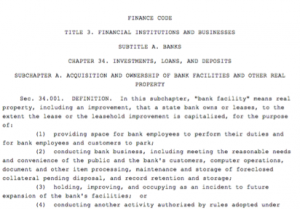 For example, while U.S. federal legislation (i.e., bills and slip laws) is stored at thomas.loc.gov (HTML and XML) and gpo.gov (at FDsys and GPO Access) (TXT and PDF), the United States Code is available at uscode.house.gov and at gpo.gov (FDsys and GPO Access), while roll call votes are at clerk.house.gov and www.senate.gov. Governments tend to compartmentalize activities, and their Websites reflect much of that compartmentalization. LegisLink.org or something like it could, at a minimum, provide a resource that helps casual and new users find where official documents are stored at various locations or among various jurisdictions. (4) LegisLinks won’t break over time. Governments sometimes change the URL locations for their documents. This often breaks previously relied-upon URLs (a result that is sometimes called “link rot”). A URL Redirection Service lessens these eventual annoyances to users because the syntax for the LegisLink-type service remains the same. To “fix” the broken links, the LegisLink software is simply updated to link to the government’s new URLs. This means that previously published LegisLinks won’t break over time. (5) A LegisLink-type service does not require governments to expend resources. The goal of LegisLink is to point to government or government-designated resources. If those resources contain anchors or id attributes, they can be used to link to the official government site. If the documents are in PDF (non-scanned), they can also be used to link to the official government site. In other cases, the files can be replicated temporarily and slightly manipulated (e.g., the tag <a name=SEC-#> can be added at the appropriate location) in order to achieve the desired results. 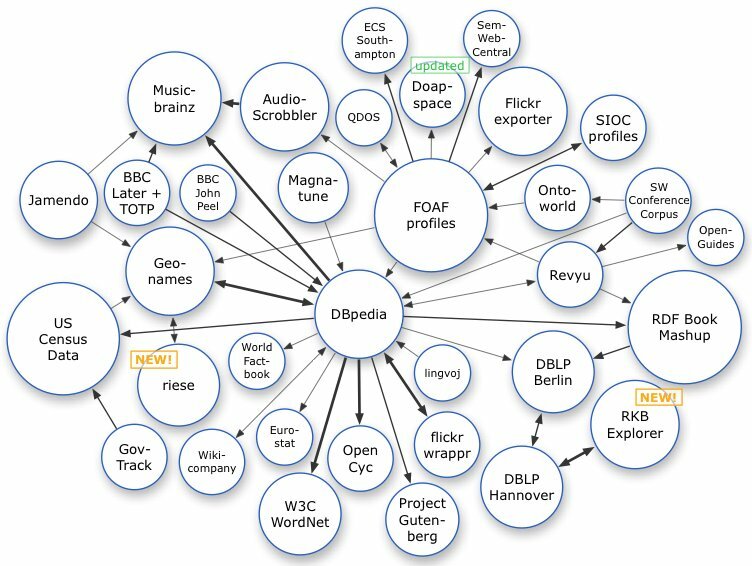 While some Websites have implemented Permalinks and handle systems (e.g., the Library of Congress’s THOMAS system), these systems tend to link users to the document level only. They also generally only work within a single Internet domain, and casual users tend not to be aware of their existence. 111.hr.3200@official;thomas.loc.gov:en$text-html could also lead to the current Congress’s H.R. 3200. A LegisLink-type service can include the URN:LEX syntax, but the URN:LEX syntax cannot subsume the simplified syntax being proposed for LegisLink.org. The goals of Citability.org, another effort to address these issues, calls for the replication of all government documents for point-in-time access. In addition, Citability.org envisions including date and time information as part of the URL syntax in order to provide access to the citable content that was available at the specified date and time. LegisLink has more modest goals: it focuses on linking to currently provided government documents and locations within those documents. Since legislation is typically stored as separate, un-revisable documents for a given legislative term (lasting 2 years in many U.S. jurisdictions), the use of date and time information is redundant with legislative session information. The primary goal of a legislative URL Redirection Service such as LegisLink.org is to expedite the delivery of needed information to the Internet user. In addition, the LegisLink tools used to link to legislative citations in one jurisdiction can be re-used for other jurisdictions; this reduces developers’ labor as more jurisdictions are added. The LegisLink.org site is organized by jurisdiction: each jurisdiction has its own script, and all scripts can re-use common functions. The prototype is currently being built to handle the United States (us), Colorado (us-co), and New Zealand (nz). The LegisLink source code is available as text files at http://legislink.org/code.html. The challenges of a service like LegisLink.org are: (1) determining whether the legal community is interested in this sort of solution, (2) finding legislative experts to define the needed syntax and results for jurisdictions of interest, and (3) finding software developers interested in helping to work on the project. This project cannot be accomplished by one or two people. Your help is needed, whether you are an interested user or a software developer. At this point, the code for LegisLink is written in Perl. Please join the LegisLink wiki site at http://legislink.wikispaces.org to add your ideas, to discuss related information, or just to stay informed about what’s going on with LegisLink. 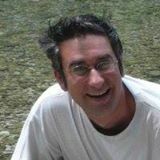 Joe Carmel is a part-time consultant and software developer hobbyist. He was previously Chief of the Legislative Computer Systems at the U.S. House of Representatives (2001-2005) and spearheaded the use of XML for the drafting of legislation, the publication of roll call votes, and the creation and maintenance of the U.S. Congressional Biographical Directory.